When you travel to Tanzania, the best places to visit and enjoy a safari include Katavi, Selous, Ruaha, Tarangire, and Ngorongoro. Of course, there's also the Serengeti where you can witness the great annual migration of millions of wildebeest. Some of the best beaches on earth can be found in the Zanzibar archipelago, and Mafia Island is equally idyllic. For more action, you can hike up Africa's tallest mountain, Mount Kilimanjaro. Other incredible mountains include Mahale, where you can visit the largest remaining population of chimpanzees in the wild. Explore all 10 of Tanzania's best destinations below. 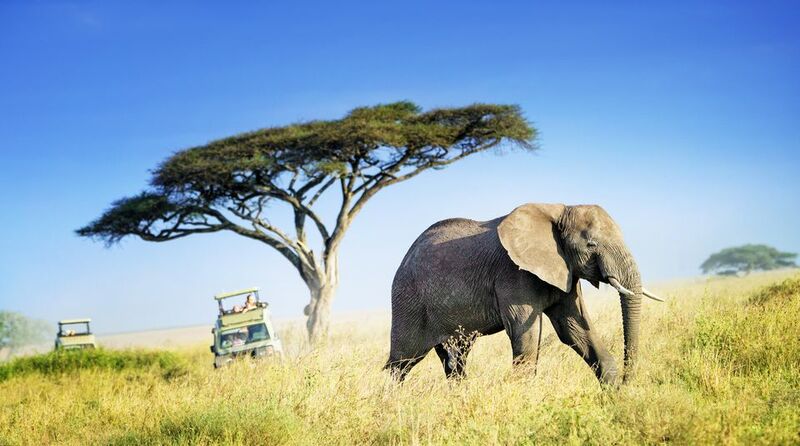 The Serengeti National Park offers the absolute classic African safari setting. The migration of millions of wildebeest and zebra starts here. The vast expanse of grasslands makes the Serengeti fantastic for spotting lion kills because you can see the whole spectacle clearly. There are mobile camps that are worth staying at because the wildlife concentrates in certain parts of the park depending on the time of year and the rains. The best time to go is between December and June, but you can't really go wrong any time of the year. A hot-air balloon ride at dawn is a truly magnificent experience. Africa is known as one of the best destinations for adventure travel and what can be more adventurous than hiking up the world's tallest free-standing mountain? Africa's highest peak, Mount Kilimanjaro in Tanzania, stands at 19,340 feet (5896m) and will take you 6 days to conquer. The exciting thing about this mountain is that anyone who is fit and determined can make it up. ​No special climbing equipment or expertise is needed. Zanzibar is one of Tanzania's top destinations because of its fascinating past and its incredible beaches. Zanzibar's location in the Indian Ocean has made it a natural trading center throughout its history. Famous for its spices, Zanzibar also became an important slave trading post under its Arab rulers. Stone Town, Zanzibar's capital, is a World Heritage site and boasts beautiful traditional houses, narrow alleyways, a Sultan's palace, and many mosques. Zanzibar has many beautiful beaches, that can be enjoyed on any budget. Some of the surrounding islands offer a total paradise for the luxury traveler, Mnemba island is absolutely idyllic for a romantic vacation. The Ngorongoro Conservation area borders the Serengeti in northern Tanzania and includes the world's largest crater which acts as a natural enclosure for almost every species of wildlife found in East Africa. This includes the very rare black rhino. The Ngorongoro Crater is where you'll witness some of the densest population of wildlife in the world and it's a truly amazing place for photographers. The Maasai still live within the conservation area, and it's also home to Oldupai where some of the ​man's earliest remains have been found. The best time to visit Mahale is during the dry season from May to October. A visit to Mahale is often combined with at least a few nights in Katavi. Mahale is linked by chartered aircraft to Dar es Salaam, Arusha, and Kigoma. Tarangire is a popular day trip for those following a standard northern safari itinerary, but its baobab dotted the landscape and numerous dry riverbeds are worth much more time. During the dry season (August to October) Tarangire has one of the highest concentrations of wildlife in Tanzania. It's an excellent spot for those who love watching elephants, zebra, giraffe, impala, and wildebeest. Katavi has all the credentials of being a top wildlife destination in Africa. It is teeming with animals, beautiful and unspoiled. The reason Katavi sees so few visitors is that it is so remote. This is a good reason to visit if you're looking for a unique safari experience since there are only two camps and it's only accessible by light aircraft. Ruaha is remote, large, and full of wildlife -- especially elephants. There are also lions, cheetah, leopard, lots of kudu, and almost every other African mammal you'd like to see. The park is home to the Great Ruaha River and it's here during the dry season (May to December) that you get some spectacular game viewing. Ruaha is only accessible by light aircraft and it's suggested you stay at least 4 nights to make it a worthwhile trip. This also gives you enough time to explore this huge area of the unspoiled African wilderness. Luckily the accommodations in Ruaha mean it's a pleasure to spend several nights. With less than 1000 visitors per year, Mafia Island is an undiscovered Tanzanian gem. It has a rich history, and a strong Swahili culture unspoiled by tourism. Much of the island and its beautiful beaches have been designated as a marine park. It is one of the best places to deep-sea fish, dive, and snorkel in Africa. You can watch whale sharks, turtles, and many other interesting species of wildlife. There are about half a dozen boutique hotels and intimate resorts to stay at. They include the eco-friendly and intimate Kinasi Lodge, Pole Pole, and Ras Mbisi Lodge. You can reach Mafia island by plane from Dar es Salaam, Coastal Aviation has regularly scheduled flights.